Make your tired or worn out power steering gearbox look AND feel new again with a PowerSteering.com professional rebuild. 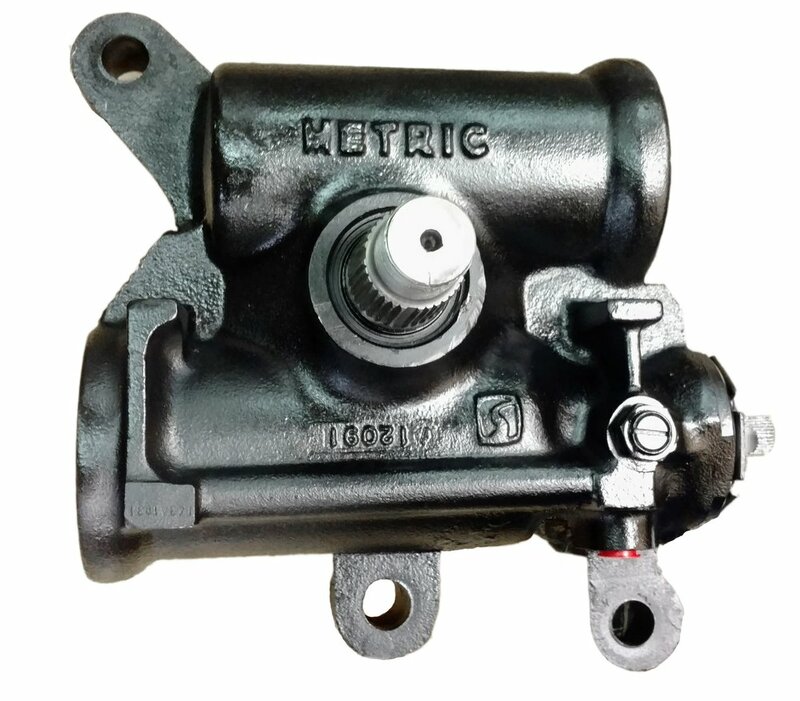 The steering unit is inspected for external damage and physically functioned, a quality record is maintained of the lock to lock turns, ratio and stops, as received. After disassembly it is cleaned and inspected for internal damage and wear. Housings are inspected and honed. The unit is reassembled with new OEM (original equipment manufacturer) seals, Teflon rings, O-rings, bearings and other parts as needed. Final testing is performed for function, pressure and leaks. Standard detailing includes priming & painting the unit. I just got back from a trip to New Mexico and driving through the Texas Panhandle where it’s always windy it took little effort to keep the truck and trailer in a straight line. Normally I would be back-and-forth with the steering wheel, but since the rebuild all I have to do is hold the steering wheel steady. We rebuilt the Dual Piston Saginaw gearbox for this 1989 AirStream in Jan 2017. The owner, from North Blenheim, New York called in July to say he had just gotten it on the road and was very happy with the rebuild. He said we would be recommending us on the AirStream forums he frequents. He sent these photos to post. Getting Your Power Steering Gearbox Professionally Rebuilt Is As Easy As 1-2-3! Once we complete our professional rebuilding process, your power steering gearbox will be returned and ready for re-installation. BONUS For Gearbox Rebuilds we will remove and replace your pitman arm at no extra charge. Should I replace my power steering pump & hoses? This depends. If your power steering pump is leaking or more than 10 years old, we recommend rebuilding your current power steering pump. The hoses should be replaced if they are brittle, leaking or are more than 10 years old. We rebuild power steering pumps also. Will my original gearbox be rebuild and returned to me? Yes. Many of our customers prefer to keep their vehicle original. Your factory core can be made better than new. Plus, using your core ensures the factory stops are in the proper location for your application to prevent loss of any turning radius. If you would like to send your original gearbox to us, please see our shipping guide. Once your original gearbox is received, we will do a detailed inspection to determine if it’s re-buildable. If not, we can supply you with another gearbox matching the style of your factory gearbox with the proper stops. If there is water in the gearbox it may not be rebuildable. What is the difference between rebuilt and remanufactured? The terms rebuilt and remanufactured are used to describe how a rebuilder or manufacturer wishes to present their product and are basically synonymous. Because there is no industry standard that sets parameters for what constitutes rebuilt or remanufactured products, rebuilders must only differentiate their products from new products by labeling them as rebuilt or remanufactured. Customers should ask a supplier of remanufactured products what they do to rebuild their products so they will know what they are receiving for their money. Can I take a power steering gearbox from a late-model Camaro or Firebird and make it work on my Chevelle, GTO, 442 or GS? The Camaro/Firebird gearboxes have internal stops built into th gearbox to limit the amount of swing for the pitman arm (“F” bodies do not need as much swing as “A” bodies). If you install an “F” body gearbox on your “A” body without removing the internal stops, the turning radius of your car will be reduced and you will have a hard time making U-turns or parking. If a late model (1980 and up) gearbox is used, the flex coupling will need to be changed because it is smaller in diameter than the early models. The power steering pump pressure and return lines must be changed, since the late model gearboxes are metric and the early models are SAE. In addition, the pressure fitting on the back of the power steering pump will need to be changed to metric. What is a quick-ratio conversion and why would I want one? During the 1960s and 1970s, GM installed power steering gearboxes in their “A” and “F” body cars that had a very slow turning ratio. It took as many as 4 1/4 turns of the steering wheel to get the wheels to turn from extreme right to extreme left. This slow turning ratio was most noticeable when parking or negotiating curves. Not only does it take more turns of the steering wheel to turn the wheels, it also takes more turns of the steering wheel to correct the direction of the car. This means that correcting quickly in a curve or taking evasive maneuvers to avoid an accident or road hazard takes longer with a slower turning ratio. With our quick-ratio conversion, we install a factory quick-ratio worm gear and power piston in your gearbox as it is rebuilt. This will give you a 12.7:1 ratio and bring your car from lock to lock in 3 turns or less, depending on your car’s application. This will greatly enhance the car’s driveability, handling, and ability to avoid road hazards. Learn more on the fast ratio conversion page.